As I continue my journey in to Food Blogging (I need theme music when I type that) I am pushing myself to create my very own recipes. So far I am doing OK but mostly I have been modifying recipes I find online to fit the Big Green Egg or my taste. Last week when I started menu planning (for this week) I wanted to create one of the recipes from scratch. To do so I needed inspiration… inspiration in the form of something I really love… hmmm… what possibly could spark such creativity!?!? BOURBON. There I said it… Bourbon! The wonderful liquid that pours from the hills of Kentucky. 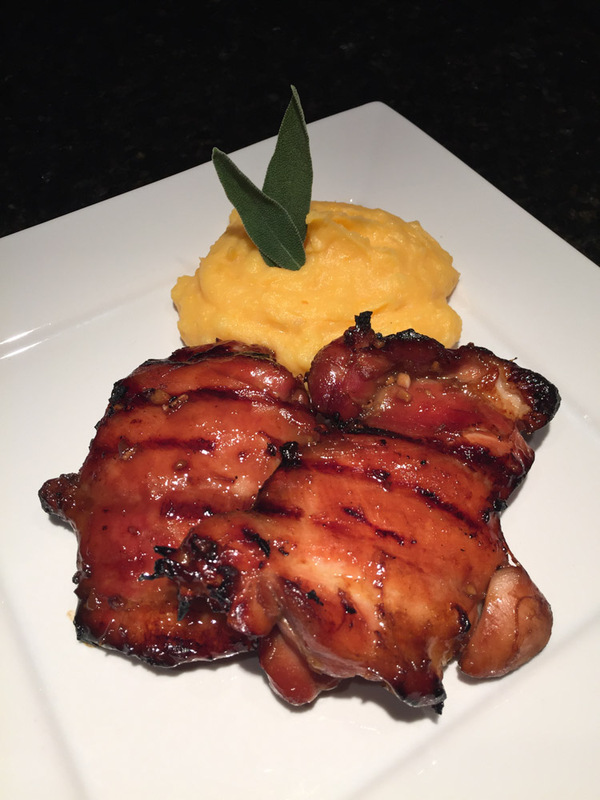 I am here to debut The BBQ Buddha original recipe… Bourbon Citrus Chicken Thighs or what I will call a “New Fashioned”. One of my favorite experiences is to have a cocktail with my father-in-law. One of his favorite drinks is the “Old Fashioned” which has bourbon, bitters, sugar, and orange. I decided to play around with those flavors and chicken thighs which are really juicy when grilled. First up is gathering all the ingredients. Then in a bowl I mixed the ginger, soy sauce, shallots, brown sugar, bourbon, minced garlic, and orange juice. From there I placed the chicken thighs in a large Ziploc bag and poured in the marinade. Gently remove the air and seal the bag and refrigerate overnight. Make sure to turn the chicken in the bag several times as it marinates. When it has sat in the marinade overnight it is time to prep the Big Green Egg and cook the chicken! Preheat the Big Green Egg to 350° and use a raised grid over direct heat. Take the chicken thighs out of the marinade and place on a plate as the Big Green Egg heats up. Put the marinade in a small sauce pan over medium heat and reduce by 1/3. Once the Big Green Egg is at temp place the chicken on the raised grid and cook for 5 minutes. Chicken on the raised grid using direct heat. Turn the chicken and cook another 5 minutes. Take the chicken off when the temp measures 165° with insta-read thermometer. Let chicken rest for 5 – 10 minutes and serve with your favorite side. Here is Debbie prepping mashed Yukon Gold and Sweet Potatoes. Debbie is tasting the potatoes! A play on the Bourbon drink the "Old Fashioned". This BBQ chicken dish features ginger, orange, and bourbon flavors. In a bowl mix the ginger, soy sauce, shallots, brown sugar, bourbon, minced garlic, and orange juice. Place the chicken thighs in a large Ziploc bag and pour in the marinade. Gently remove the air and seal the bag. Refrigerate overnight. Take the chicken thighs out of the marinade and place on a plate. Put the marinade in a small sauce pan over medium heat and reduce by ⅓. Let chicken rest for 5 - 10 minutes and serve. I love the name “new fashioned”. I think this a great recipe and it sounds delicious !